The head of SCEPTER4 and the Blue King. Reisi is a sophisticated, observant and composed individual who is cautious in the battlefield. Though he is willing to use physical action in a fight, Reisi attempts to win through negotiation instead. He is a natural leader and generally puts the concern of innocent lives over his own. Though he possesses a general loathing towards Mikoto Suoh, Reisi still accepts him as a human being. He takes immediate notice when his vice-commander displays apparent disregard for his civil rights. However, he remained indifferent to how the idea could effect the Red King, even stating that it was a good one. Reisi is fond of solving jigsaw puzzles in his spare time. 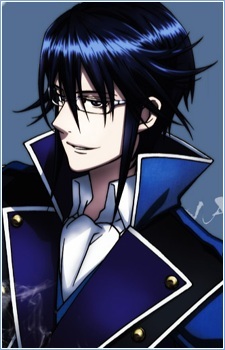 As a member of SCEPTER4, Reisi has power over lightning, imbibing himself in a blue color. When exerted, the aura has the defensive potential to protect him and his subordinates against a direct attack from the flames of Mikoto Suoh, known as the king of HOMRA and an incredibly powerful combatant. In this week's K: Return of Kings, our favorite silver-haired hero returns after falling from the sky, and he's about to make his move to fight JUNGLE. He won't be fighting alone though, as he sets up something big for the Green King and his army.